As usual, when I decide to do something, I jump in head first. I've also ordered some "Theme Cards" just for fun. I hope it all arrives soon as I can hardly wait to get started now that I've caved in to the idea! The idea of Project Life is to "document" your life as a project. Some people (not many, I assume) choose to do a layout every day. Others do one per week and still others do it once per month. I'm going to attempt the once per week, which means that at the end of the year, I'll have 52 layouts . . give or take a few, no doubt. The thing is, I do take photographs that aren't necessarily worthy of a whole scrapbook page and all the effort that goes into it, but I want to start taking more photos and better ones. This Project Life is perfect for that. Also, I've started a new diet (more on that in a moment) and I'd like to document my progress, assuming there IS some progress! 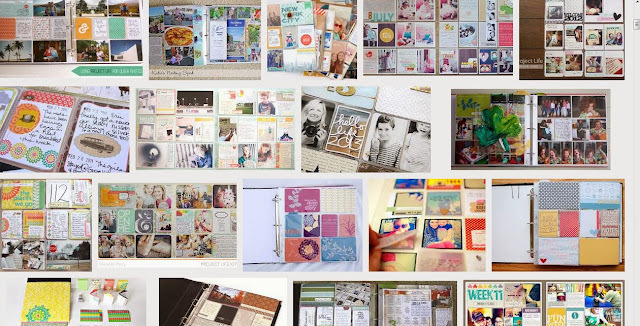 It sounds very similar to the "Book of Me" scrapbooks that we did several years ago, but much easier and quicker. You can also take a sort of art-journal approach, using the theme cards, sketches, and your own original art on small cards. I like that idea a lot, as nothing intimidates me like a blank piece of 12 x 12" paper or a blank page in an art journal. I'm hoping to let my limited creativity have full rein and see where it takes me. Now about the diet. I read about the "5:2 Fast Diet" in several recent articles in magazines and newspapers. I've tried several other diets and they work well and I do lose considerable weight to begin with, but then I get terribly tired of obsessing about calories or points (Weight Watchers) or GI content, etc. and fall off the diet. I end up putting back on the weight I lost PLUS some!! The last time I tried Weight Watchers and failed, I said never again. Now this diet is decidedly different. In a week, I fast two days (usually Tuesday and Thursday, but it's flexible). On the two Fast Days, I can have up to 500 calories, which isn't much but it does keep you from going into starvation mode. The other five days, you can eat relatively normal, providing "normal" isn't pigging out on chocolate cake, pasta, fried potatoes, etc. I've honestly found it isn't near as hard to do as I thought it would be. There are several good cookbooks specifically designed for the diet and loads of help online. Since 31 December, I've lost 8 lbs and that's included five Fast Days and trying to eat sensibly on the non-Fast Days, so it's working okay so far. Apparently there are many health benefits, aside from the weight loss aspect. I suppose those would become noticeable after I've been on it awhile. Here's hoping my Project Life things arrive soon, so I can get started while I'm so enthusiastic. I am doing Project Life this year, we are only three weeks in and I am loving it.